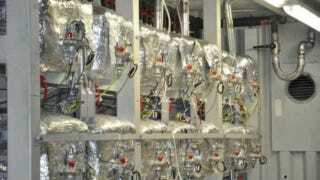 Cold fusion is a theoretical (and highly doubtful) reaction that makes huge amounts of energy. Last year, the inventor claimed his Energy Catalyzer fusion device could produce electricity at 1% the cost of coal. This week, a North Carolina company bought the rights to the tech. Did they get bamboozled? Probably. As PopSci points out, inventor/convicted scam-man Andrea Rossi's studies "proving" the E-Cat's efficiency have not been peer reviewed, and more perplexingly, the chemical process that's supposedly behind the system simply can't work the way the paper explains it. And for all of Rossi's bravado and self-styled confidence in his device, he's repeatedly refused to allow third-party testing, including by NASA. All that doubt doesn't seem to have stopped the new owners of the E-Cat technology, Industrial Heat LLC. In fact, according to the company's press release, "since acquiring Rossi's technology, IH has engaged in a broad-based effort to protect it by preparing numerous patent applications related to the core technology as well as associated designs and uses."